Cappuccinos (and lattes, and mochas, etc.) are delicious, but they are rather expensive. There’s a reason for that; they are all espresso-based drinks, and espresso machines are NOT CHEAP. Commercial espresso machines can easily run over $10,000. You’re also paying for (hopefully) top-quality beans and the time and expertise of your barista. But is there a way to get comparable quality drinks at home, without spending thousands of dollars? Let’s break down the components. The most expensive part of the equation for home consumers is making the espresso. Whether you want the convenience of a superautomatic (that uses pods/capsules), or the control of using a semiautomatic (that uses fresh grounds and requires tamping), either method will set you back at least a few hundred dollars (not even counting the grinder!). However, there are a couple of cheaper options. 1) Moka pots. In the USA, I most often see Bialetti brand moka pots in stores. This is a stovetop “espresso” maker. I put espresso in quotes because unlike true espresso, it does not produce crema (the rich, reddish-brown layer on the top of an espresso shot where much of the sweetness resides). Rather, this makes a very strong coffee. These are pretty easy to use. You put ground coffee into the basket, water into the bottom compartment, and screw the whole contraption together and heat the device on the stove until the top compartment is full of your brewed coffee. Because it uses no paper filters, it holds much of the natural oils in a coffee (like a french press would). Because the water by definition has to be boiling or very close to it, some people (myself included) find the coffee this method produces to be on the bitter side. Cheaper versions of moka pots are often made of aluminum; more expensive ones can be found made with stainless steel. 2) AeroPress. This device has taken the specialty coffee world by storm over the past few years for its design, its affordability, and its ability to be customized to the user’s brewing preference. It is made of plastic (BPA-free), so if you want to avoid plastic, this is not the choice for you. However, I find the AeroPress to be preferable to the moka pot because you can brew with water at lower temperatures. The manufacturer recommends 175 F, but I usually brew between 190-200 F. It does come with paper filters so you will have less of the oils, but if it’s important to you to get all the natural oils in your cup, you can buy an Able Brewing Disk made of stainless steel. This will not produce crema either, but it will produce a lovely strong coffee concentrate, and you also have the ability to use it to brew closer in style to regular brewed coffee if you wish. Fancy espresso machines with steaming wands inject steam into milk to simultaneously heat and froth it. At home, you will have to do the steps separately. I recommend frothing and then heating. Cold milk froths much more readily than warm milk. The lower the fat percentage, the easier the frothing. You can buy frothing wands, frothing carafes (plunger-style), and electric frother/milk warmer combos. However, especially if you’re wanting to keep this as cheap as possible, I would just grab a glass jar with a lid. A large mason jar or a clean spaghetti sauce jar will work great! Put cold milk in and shake it vigorously until the milk foams. Remove the lid and put the jar in the microwave to heat for a while. The foam will climb – don’t be alarmed. Brew the AeroPress coffee directly into your mug according to the manufacturer’s instructions. Once you’re done, froth and heat your milk. Grab a large spoon. Pour the milk into your waiting mug and watch the coffee turn a lovely camel color. Spoon off or pour as much foam as you want onto the top of the drink. Voila! For this test, I used the same water (Nestle Pure Life), same beans (20 g Blue Bottle Hayes Valley Espresso), and same milk (Kroger brand lactose-free whole milk, 4 oz). I brewed the coffee in the AeroPress the standard way (not inverted). While it was steeping, I poured 4 oz of milk into a clean 24 oz spaghetti sauce jar, put the lid on, and shook it for about 20-25 seconds. Then, I removed the lid and placed the jar in the microwave for 30 seconds. At that point I determined it needed more heating, so I put it in for another 25 seconds, but pulled it a little sooner because I saw the foam was filling up the whole jar and was about to overflow! So, if you plan to use more than 4 oz milk, use a bigger jar. At this point, the foam was VERY frothy so I stirred the milk and foam a little bit to deflate things before assembling the drink. I ended up not really needing the spoon to spoon off foam because it slid right out of the jar, but you could of course adjust this to taste. Next, the cappuccino made with my Silvano and its steam wand. You can see that this milk, while not quite microfoam, is less airy than the jar-frothed method. The espresso crema rose to the top as I was pouring the milk into the cup, which is why the surface has lovely tan coloring. Tasting these back-to-back was interesting. The AeroPress cappuccino was smooth and quite easy to drink. If I got this drink in a to-go cup at a Starbucks, I would drink the whole thing with no complaints! It was delicious. 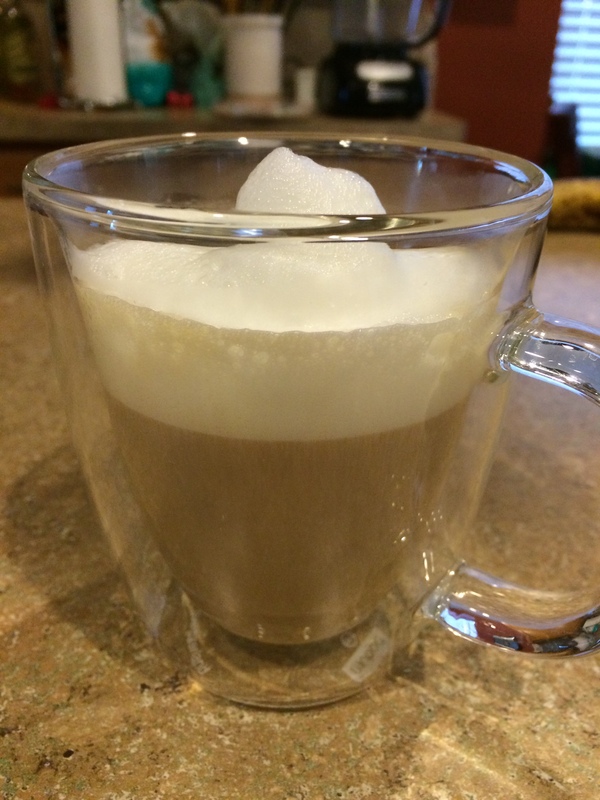 The “real” cappuccino, by contrast, had a stronger and more complex coffee flavor. Between the two, if I had to pick one, I absolutely would pick the “real” cap. However, I have nothing bad at all to say about the AeroPress cap, especially considering the price differential. Can you get cheaper espresso machines? Yes, of course. However, they are harder to use because they have less (or no) temperature stability, the steam power for the wand is poor, and you have to wait between pulling the shot and steaming the milk so one element is deteriorating while you wait to do the other. 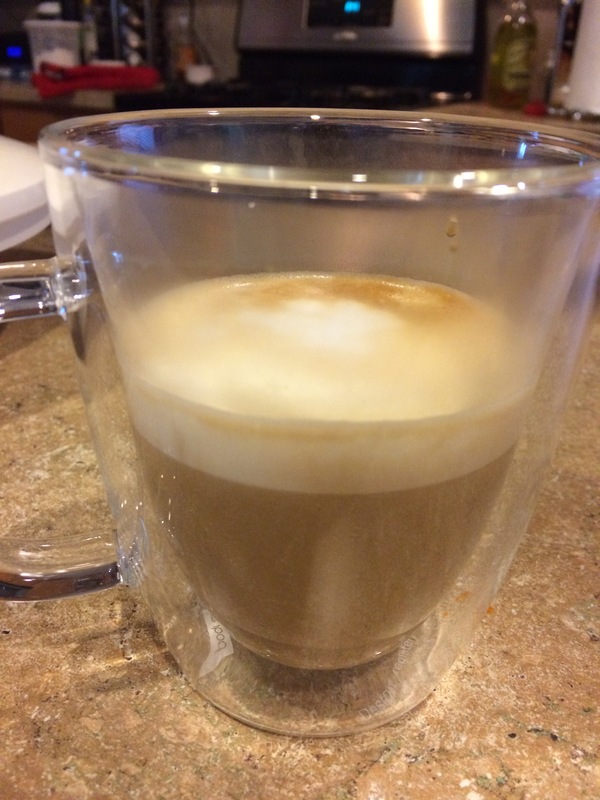 If you drink espresso shots straight (as I do), an espresso machine is a great thing to have at home. However, if you only really drink milk-based drinks and you want a “best buy” option that won’t break the bank, I have no reservations at all about recommending the AeroPress! It’s easy to use, easy to clean, and it’ll pay for itself after about a week’s worth of lattes. I was already impressed with this little device but even moreso now! Well done. Although, I’ll say after being in the coffee business with my buddy, dairy is actually the most pricy item in a milk based drink these days.